Acting on a tip from a fellow amphibian researcher, Jesse Dykstra sought out the Coeur d’Alene salamander, an endangered species in the western United States, and discovered them in three locations in Mount Revelstoke National Park. Coeur d’Alene salamanders live in the spray zone of waterfalls and cascades. They only come out at night when it’s raining, and the temperature is above seven degrees. No wonder we missed it. Who would have thought to search steep, wet terrain in the middle of the night? The long-toed salamander is the more common salamander in this region. It frequents areas of wet streamside vegetation and sodden, rotten logs. Salamanders must live in wet places because they have no lungs and breathe through their skin, which must be kept moist. Dykstra’s salamander discovery was incidental to his main research on western toads. 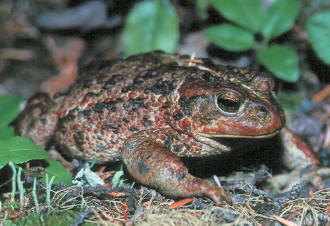 As a student at Okanagan University College required to complete a thesis for his undergraduate degree, he surveyed areas known to have toads in 1983 when the parks’ inventory of biological assets was conducted. His work indicates that the presence of western toads along the Trans-Canada Highway corridor through Mount Revelstoke and Glacier National Parks has declined sharply. Toads are still widespread in the parks, but in areas away from the highway. Toads are amphibians, breeding in water where they first emerge as tadpoles. Later as adults, they disperse to a variety terrestrial habitats. I’ve seen specimens as large as my fist living in environments as diverse as valley bottom forests and alpine meadows. Likely, the absence of toads in ponds near the highway is due to their death on the highway as they try to reach their summer habitats. Other amphibians in this region are faring better than toads. Columbia spotted frogs are also found in the same wetlands along the highway corridor, but their life cycle keeps them in the ponds, so they do not try to cross the highway as dispersing toads do. These frogs are readily seen near the Skunk Cabbage Boardwalk Trail. There presence is a good indication that the spills and leakage from the 1.8 million vehicles per year using the Trans Canada Highway has not adversely affected water quality. Pacific tree frogs, also known as chorus frogs, are the loudest amphibians of the Columbia region. In early spring, I can hear them at night, in great numbers, from as far as 500 meters away. After their spring courtship chorus, they migrate from the ponds into the forest to reside on tree branches, where they only occasionally croak to indicate their presence. Dykstra is but one of many students over the past decade that has collaborated with park biologists to produce significant results for ecological research and monitoring. To encourage this type of activity, the Friends of Mt. Revelstoke and Glacier annually offer a $5000 grant to a student researcher. To learn about this and other programs offered by the Friends, visit their website at http://www.friendsrevglacier.com.